Bracknell District Urban Wildlife Group (BDUWG) was launched in March 1989. It existed as a separate organisation until July 2013 when it was incorporated into Bracknell Forest Natural History Society. BDUWG operated in Bracknell Forest Borough, an area subject to substantial development pressures. 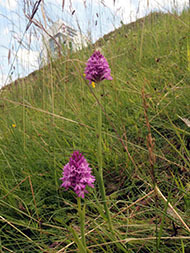 Despite these pressures, wild plants and animals survive and flourish in gardens, roadside verges, parks and open spaces. BDUWG was motivated by the belief that the the presence of this wildlife enhances the quality of our environment. Over the 24 years of its existence BDUWG produced 90 Newsletters, reporting on many aspects of the wildlife in our Borough. In some fields, including dragonflies and wild orchids, BDUWG built up extensive data bases of information.